The Sulphur Fire, which is part of the Mendocino Lake Complex, started at approximately 11:59 p.m. on October 8, 2017. The fire originated along Sulphur Bank Road off Highway 20 in Clearlake Oaks, near the Clearlake city limits at Clearlake Park. The fire quickly spread to the Elem Colony and into the city of Clearlake. The fire blazed for 19 consecutive days till it was fully contained on October 27, 2017. The fire perimeter partially straddles Sulphur Bank Ridge, a prominent, roughly east-west trending ridge that creates a peninsula projecting into Clear Lake. Along the northern flank of Sulphur Bank Ridge and within the fire perimeter is the Sulphur Bank Mercury Mine Superfund Site managed by the U.S. EPA. The Sulphur Fire’s impact on Lake County neighborhoods and business districts has been severe. 2,200 acres burned, 140 homes were destroyed, hundreds of persons were evacuated and dozens of businesses were forced to close. The cause of the blaze is under investigation by the California Public Utilities Commission and Cal Fire. Notably, PG&E’s management of its electrical infrastructure and its maintenance of high voltage wires and poles is being evaluated, and information has emerged showing that PG&E may be at fault. 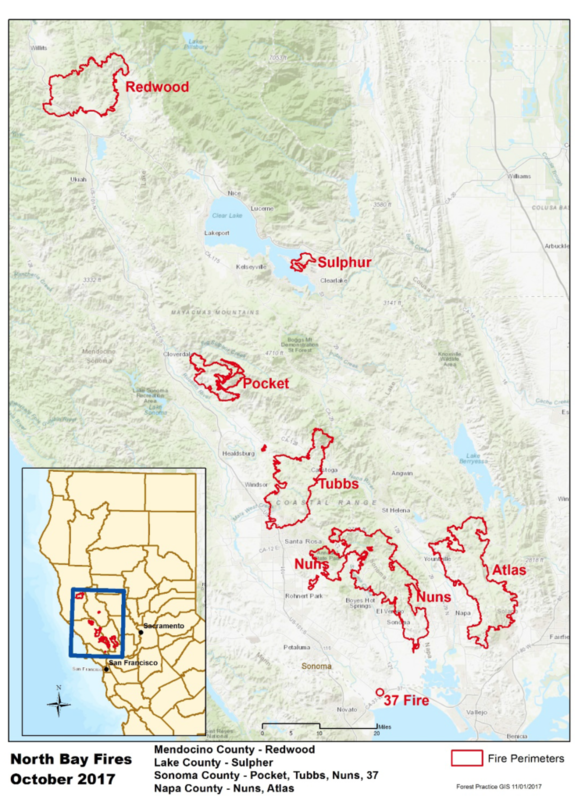 In 2015, PG&E was found to have caused the Butte Fire in Amador County which claimed two lives, burned over 70,000 acres and destroyed over 921 structures. The cause was a poorly maintained tree that came into contact with a power line. Watershed Emergency Response Team Assessment. Because a fire the magnitude of the Sulphur Fire can result in post-fire dangers to persons and the environment, the area was evaluated by Watershed Emergency Response Team, a group of geologists, engineers, hydrologists and foresters. The WERT prepared this report of their findings. The WERT team noted that a primary concern for burned watersheds is the increased potential for damaging flood flows and increased probability for landslides and debris flow occurrence. It is therefore recommended that all homeowners speak to a qualified professional to determine any health-safety and environmental risks, including flooding, landslides and rock fall, that now exist because of the fire. Additionally, public health information for residents or individuals in the area of the Sulphur fire can be found here. It is recommended that all homeowners speak to a qualified professional to determine any health-safety and environmental risks, including flooding, landslides and rock fall, that now exist because of the fire. Further, if you’ve been impacted by the Sulphur Fire, document all of your expenses since the fire, including medical bills, lodging and all additional costs incurred due to relocation. Track all damage to real property and personal property through a diary and photographs. If you have not yet contacted your insurance company, do so as soon as possible. For a free consultation or if you have any questions, we welcome your call to this office. We Know How To Beat Insurance Companies. Since 1959 we have fought against insurance companies for our clients. Auto insurers, homeowners insurers, property insurers, medical insurers, casualty, excess, umbrella, special Ines and city, county and government insurers know we will fight for our clients. Insurance companies are not an injured person's friend- we know that and fight for your rights.